Cameco's highest priority is maintaining the safety of our workers, contractors and the public. By creating a work environment that minimizes and eliminates hazards and ensuring work processes reflect a focus on quality, we are building a workplace that assures workforce and public safety and protection of the environment. Cameco's Blind River Refinery celebrated a full decade of operation without a lost time injury in 2016. This was the eighth time Blind River received Cameco's Mary-Jean Mitchell Green award for safety performance. Our employees and contractors integrate safety and health, radiation protection, environment, quality, continual improvement and emergency preparedness and response, as well as contractor safety and environment programs into every aspect of our Ontario operations. We closely monitor operations to identify and address risks that may have an impact on safety, health, the environment and quality. Successful candidates for positions that are safety-sensitive or at safety-sensitive sites, must take and pass a substance test (which includes marijuana testing) as a condition of employment. Marijuana remain in a user’s system for about 30 days, so applicants/employees who have recently used marijuana should not expect to pass a substance test. Positions: Positions that require driving to communities as part of their responsibilities, such as community relations liaisons, and corporate responsibility positions. Cameco is committed to creating and maintaining a welcoming, inclusive, barrier-free work environment which allows all employees to perform their jobs at an optimal level. Achieving this desired environment depends upon mutual respect, creative problem solving and co-operation. We have been recognized annually as one of Canada's Best Diversity Employers since 2010 and as one of Canada's Top 100 Employers since 2009. Every employee has the right to work in an atmosphere that is free from harassment, violence and discrimination. Cameco's respectful workplace program reflects our commitment to create and maintain a work environment in which all people are treated with dignity and respect. 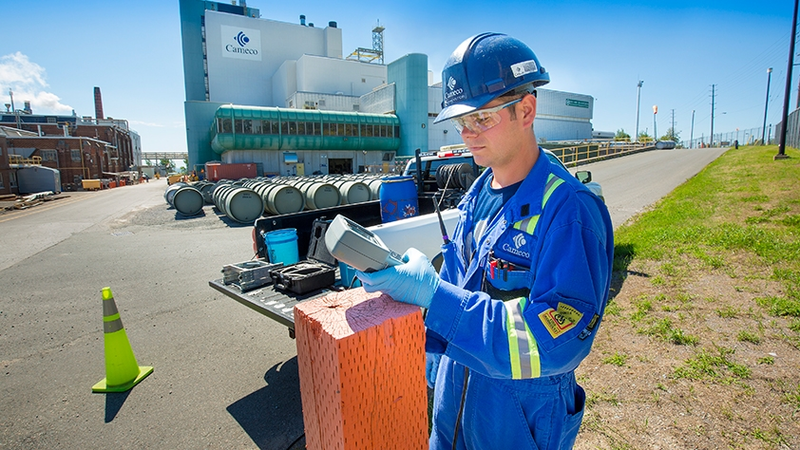 Cameco provides ongoing learning opportunities to build a respectful workplace and is prepared to take prompt action when there is evidence that this program is being violated. All employees must attend respectful workplace courses that clearly identify expectations. Cameco's Code of Conduct and Ethics applies to all employees, officers and board members of Cameco and its subsidiaries. The code includes guidance on how to conduct business according to our values — safety and environment, people, integrity and excellence. By conducting ourselves ethically and with integrity, we continue to build strong relationships and earn the trust of others. How we do business is what makes Cameco a supplier, partner, investment and employer of choice in the nuclear industry. Cameco's compensation program has two components: base and variable pay. Base pay is determined on job categorizations and market surveys or, in the case of unionized employees, is negotiated under the union contract. Variable pay includes annual performance incentive bonus programs and employee share ownership programs. In addition to fixed benefits, salaried employees participate in Cameco's flex-benefit program which provides a choice of core health and dental benefits and flex-credits. Cameco's unionized workforce also enjoys competitive benefits, negotiated through collective bargaining. Cameco's retirement programs help employees build financial security for their post-employment future. Contributions are made by both Cameco and the employee based on a percentage of the employee's earnings. Acknowledging that employees' well-being is measured in many ways, site-by-site Live Better committees help determine the best program fit for each workplace. We make significant investments in training and career development programs to ensure our employees have every opportunity to reach their professional goals. Cameco provides financial support to eligible employees working towards a certificate, diploma, degree or designation accredited program. Financial support covers the cost of tuition, books and related expenses. Cameco has a suite of leadership programs that educate, develop and support interested employees, from entry level to executive level, who have the skills and desire to take more of a leadership role in the corporation. We encourage and support employees who make a difference in the communities where they work and live through the many volunteer opportunities we offer year-round. Whether it's taking part in a community cleanup project, donating to our record-breaking employee giving campaigns or talking to high school students about career opportunities, our employees take the initiative to help others. It's part of our Cameco culture.